With Danny Grissett on piano, Johannes Weidenmueller on bass, Eric Doob on drums and Tim Collins on vibes. Heard the second set – was great! I love Tim Collins’s approach – seems easygoing and simple, but is also really well balanced and dynamic. Sometimes have the energy of a rock band, with vibes 😉 ! Really good compositions as well. I heard Tim’s New Tune again 🙂 My favorite one… Yeah, that band was amazing! Who is that drummer, sounded really good! Seems like Solo Kitchen Bar is a great place to hear jazz on Sundays – this time it was John Ellis Group playing, really amazing band, sounded great. Finally got to hear Tim Collins on vibraphone, loved it, especially his phrasing. . One of the highlights of the night was certainly when they played Do You Know What It Means To Miss New Orleans. I got to thinking that laid back and bluesy vibes playing must be one of the sexiest things ever 🙂 But the band was still missing Grant Green for that tune :D. Yeah, and besides being an amazing tenor player, John Ellis is a really brilliant composer as well, heard a lot of great original tunes that night. 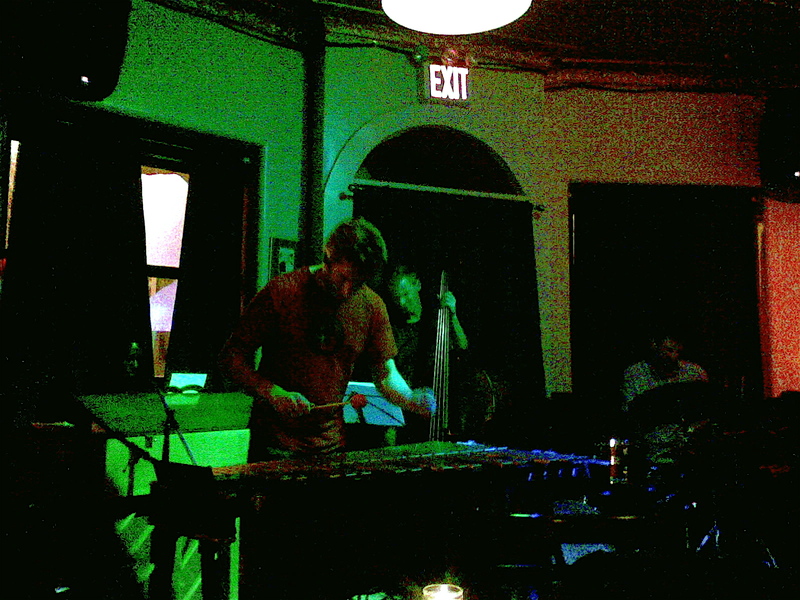 Couldn’t make up my mind about what I should hear last night so I tried to have it all – first went all the way down to Flatbush, Brooklyn to Solo Kitchen Bar to hear Brad Shepik’s trio. This time it was Adam Niewood on sax and Mark Guiliana on drums. Just can’t get enough of Mark Guiliana’s drumming! Almost can’t believe my ears at times, all this great music coming from just one guy playing the drums… I really recommend everybody to check him out, who hasn’t already. Don’t know much about drumming but never heard anyone play like that. How come I never really even noticed the drummers so much before coming here anyway? And here I end up mainly listening to the drummers. The second stop was intended to be 55 Bar. In some mysterious way the subway followed a really weird route back to Manhattan – I was supposedly on a 2 train Bronx express, but it stopped at really wrong places according to the map and I ended up at an unexpected station and walked to 55 Bar. So I actually only heard the last tune of Mike Moreno’s Quartet – it was a good one :). Liked the sound a lot, actually there was Tim Collins on vibraphone – really would have wanted to hear some New York vibes playing. Next time then, I guess. We hanged around for a couple of beers at a bar next door, Kettle, with Mike Moreno, Kristjan Randalu, Tim Collins and later on a Canadian double bass player girl. Really had a good time with them.